This is our unique interpretation of the Bypass Isolation Automatic Transfer system which we call The Hot Standby Bypass Isolation Automatic Transfer system. It is unique in that it does not incorporate the failure point which develops through the life of normal bypass isolation transfer systems. This falilure point is eliminated by utilizing two sets of paralleled drawout transfer breakers conifigured in pairs that are continuously operated. The typical bypass isolation transfer system uses a drawout transfer pair of switches or breakers and a fixed bypass transfer. The bypass transfer is never exercised and typically fails when called to duty due to lack of mechanical exercise. Our transfer system alternatively interchanges the pair of service breakers at each sequence so that all system breakers are exercised – thereby self-maintaining the desired redundant operation. Furthermore, our design enables the fully-automated, closed-transition, bypass capability without the need for difficult to understand key interlocking means which minimizes effects to the connected loads. We call our bypass control “Hot Standby” because the alternate feed for any load is always available for immediate bypass operation. The Hot Standby Bypass Isolation Automatic Transfer system is drawout switchgear utilizing removable insulated-case power circuit breakers to enhance system flexibility. The transfer breakers are equipped with fully automated controls, having neutral position time delays to protect electronic and motor loads from power surges. All controls feature plug-in relays that have indicators to display proper operation. We provide portable breaker lifting devices or overhead trolley cranes for ease of maintenance as well as service and distribution drawout switchgear with integral weatherproof NEMA 3R enclosures. 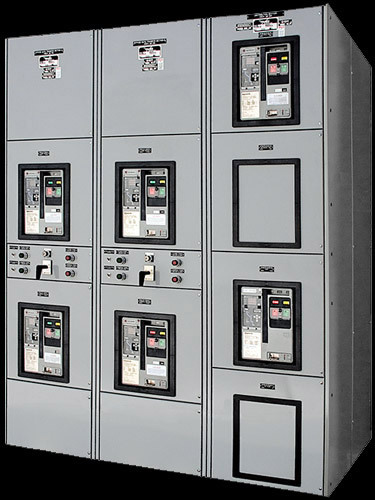 This switchgear features our Benjamin Compass Control touchscreen system for complete switchgear and standby generator control and monitoring. Loads from all switchgear manufactured by W.A. Benjamin Electric Company can include connections to bus duct. Hot Standby Bypass to the alternate same-source transfer breaker. Improves reliability and power quality to the connected loads by minimizing interruptions.